Now, here is the same info in Jamie-speak. Use what you have on hand. That random charm pack you only got one of? Chop up the pieces into quarters. Scrap bucket over flowing? Dig into it. 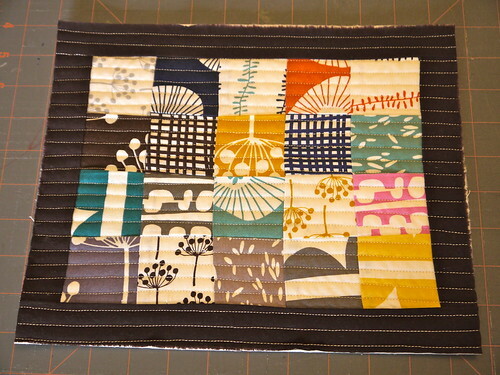 Pick a contrasting strip of solid for the border (I had leftover Kona Espresso from a quilt border and I just ripped 1.5″ strips to get my border pieces). 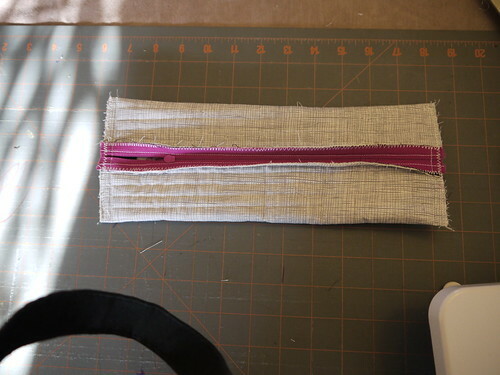 Pick out a cool zipper and as long as it is longer than your fabric piece, you are fine. I only buy 14″ long zippers. I can use them in garments and also in pouches. I love to buy assorted packs from Zipit on Etsy that way I always have tons of colors on hand. There are four basic steps to this project. I will give you a basic outline and then if you want the full-on 46 picture annotated series, then please click here for my tutorial. 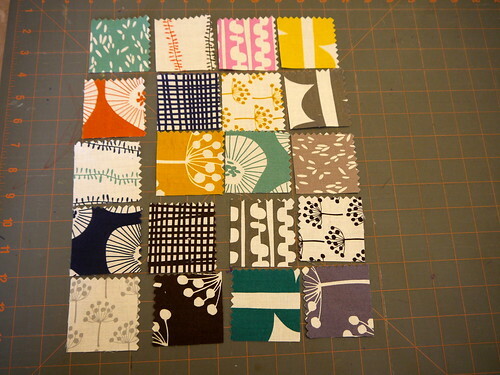 First, you make your patchwork grid by sewing your squares together and adding the border. Second, you add batting and backing and quilt your piece using 1/4″ straight line quilting. Once trimmed, your piece should be 9.5″ by 11.5″. 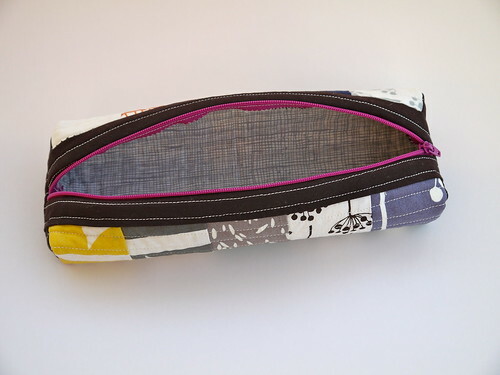 Third, you decide whether your want a narrow or wide pouch and attach your zipper accordingly. 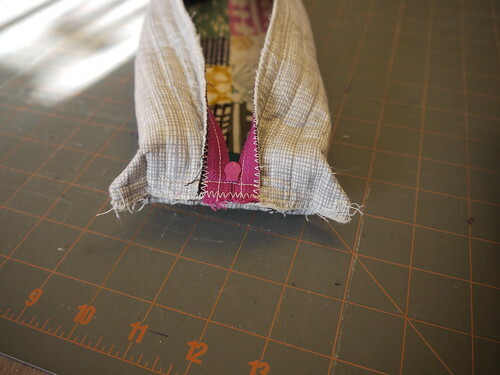 Finally, you stitch together your sides seams and box your corners. It really is that simple! When you are finished, simply turn your pouch right side out and enjoy. I find having pouches this size to be very useful. I use one to keep my hand-sewing supplies with me at all times. I also use one to hold phones chargers and other small electronic gear. 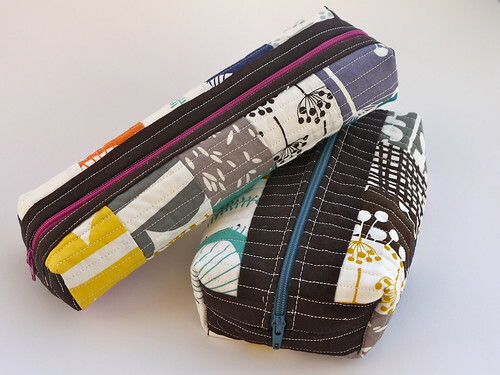 The narrow pouch would be great for some knitting needles or as a pen or marker case. The narrow pouch is 9″ x 3″ x 1.5″. 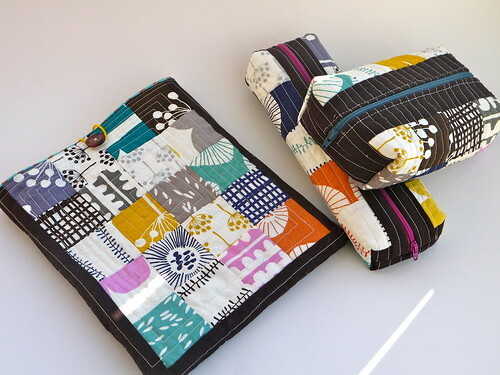 The wide pouch is 7″ x 4.5″ x 2″. Here is the set of pouches I made from just the one charm pack and some scraps, and a few zippers. iPad case tutorial from Amber at One Shabby Chick. Please let me know what you think of the tutorial. It is the first one I have ever written, so feedback would be great! I feel like I could have spent hours agonizing over how to write each step, but in the end, I thought I would just put it out there and let it evolve and grow as needed. Note: The full-on 46 picture annotated tutorial is available here. What would the measurements be for the narrow one for before you start?